Believed to be indigenous to the Malabar Coast of India, Tellicherry peppercorns are spicier than the common one and will enhance the flavor of all your recipes by taking things up a notch. After you taste the freshly ground flavor, it is difficult to go back to using the inferior store bought variety. 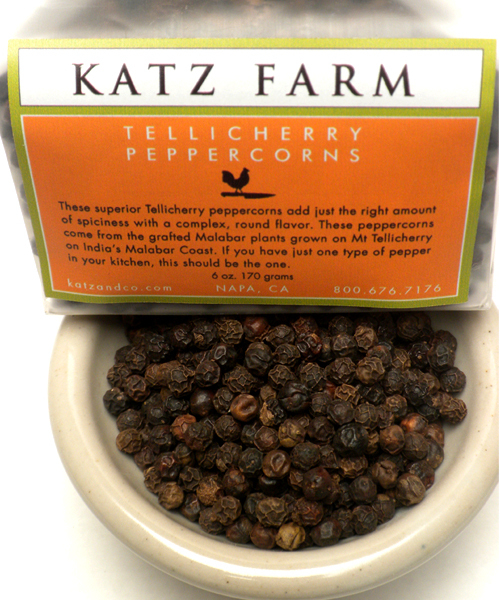 Our superior KATZ Tellicherry peppercorns add just the right amount of spiciness and a complex, round flavor...a must for the well-stocked kitchen. Get a perfect tellicherry pepper grind for your kitchen or table every time with our OLIVE WOOD PEUGEOT PEPPER MILL or our SKEPPSHULT CAST IRON PEPPER MILL.